Have you ever wondered how to make sushi rolls? While a sushi roll may look complicated, even a novice can make one at home. The word "sushi" has become synonymous with raw fish, often wrapped in rice and seaweed. 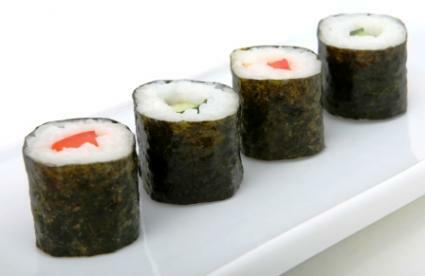 In fact, the word sushi refers to the specific type of rice used in the meal. Sushi can be served in a number of ways, including rolled sushi or maki. Rolled sushi consists of a sheet of dried seaweed, known as nori, on which sushi rice has been pressed. The rice and seaweed can be turned rice side up or nori side up and filled with a mixture of fish or vegetables. The rice and nori is then rolled up around the filling to produce a sushi roll. While you've probably eaten sushi mainly in restaurants, you may be pleasantly surprised to find that most grocery stores sell all the supplies you need to make sushi rolls right at home. The location of the supplies will vary by store; check near the Asian foods, specialty foods or organic food sections. The process itself is simple, but may require practice before you are able to make sushi at home with ease. Lay the bamboo mat on the counter and place a sheet of nori on top. Dampen your hands slightly in water to keep the rice from sticking to them and scoop up a ball of rice the size of a tangerine in your hand. Press the rice into the nori, gently spreading and pressing it across the nori until it covers the entire surface in one, even layer. Be extremely gentle when spreading the rice to avoid tearing the nori. Slice your fish or vegetables into finger-length portions. Leave the nori rice side up for standard maki, or flip it over and lay the rice side down on the mat for "inside out" or "rice side out" maki. Lay your sliced fish or vegetables across the middle of the nori or rice lengthwise. For small rolls, use a single layer of ingredients; for larger rolls, two or three layers of food can be laid side-by-side. Roll up the bamboo mat, bringing the nori, rice and filling together in a cylinder. Lift the end closest to you and fold it toward the other side. Allow the end to rest, pick up the center and use it to gently roll and press the maki forward. Let the bamboo mat fall forward as you roll the center portion to the end. Squeeze the mat and therefore the maki together to form a tight roll. Remove the maki from the mat and dip your knife in water to prevent it from sticking to the rice. Locate the center of the maki and make a single cut straight through with the knife. Re-dip your knife in water, line up the two halves, so they sit side-by-side and cut them both in half at once. Line up two pieces of maki together at a time, re-dip your knife in water before each cut, and slice through the maki pieces in half until you have 6 or 8, even pieces of maki. Arrange the maki pieces on end, garnish with wasabi, pickled ginger and soy sauce. Always make sure you use the freshest possible ingredients if using raw fish. For rolls containing cooked fish, make sure the fish has been adequately cooked through before consuming. Learn how to make sushi rolls at home, and indulge in this gourmet treat whenever you like.